Can Russia renounce Bashar al-Assad? After the chemical attack in Syria and the subsequent U.S. bombing of a Syrian military airbase, Western countries – as well as several Middle Eastern nations – are calling on Russia to stop supporting Syrian President Bashar al-Assad. But Russian experts believe that Moscow will cease its support for Assad only in an extreme case. The situation in Syria has again escalated. After the chemical attack in the Idlib Province on April 4, which the U.S. and other Western countries accuse Bashar al-Assad of committing (Damascus and Moscow deny the regime's responsibility), Western diplomats are now more adamant than ever that Assad must leave. They’re also accusing Russia of supporting his regime. U.S. Ambassador to the UN Nikki Haley has underlined that Assad cannot be a part of a future solution to the crisis in Syria and on the eve of his visit to Russia on April 10, U.S. Secretary of State Rex Tillerson placed partial responsibility for the bloodshed in Syria on Russia: "The Russians have played now for some time the role of providing cover for Bashar al-Assad’s behavior." Also, in the words of Haley, Western countries are considering the possibility of introducing new sanctions against Russia for supporting Assad. For now, Western countries and their allies in the region are only calling on Moscow to stop supporting Damascus. According to the mass media, this is the option that Rex Tillerson proposed during his talks in Russia. But how realistic is it? Traditionally, Moscow’s rhetoric on Syria has bene cautious, stressing that it supports the legitimate government in the country, but claimed it’s not loyal to any particular leader – Assad or anyone else. Commenting on the chemical attack in Idlib, on April 6 Russian Presidential Press Secretary Dmitry Peskov said that Russia's support for Assad is not unconditional. At the same time Peskov noted that Russia and Damascus "completely support each another." While the West and a series of Middle Eastern countries (Turkey, Israel, the Persian Gulf Arab nations) are harshly criticizing Assad's regime, Russia and Iran are supporting him. Russian President Vladimir Putin and Iranian President Hassan Rouhani both called Washington’s "aggressive" actions against a sovereign state (meaning the U.S. missile attack on a Syrian airbase) "unacceptable." 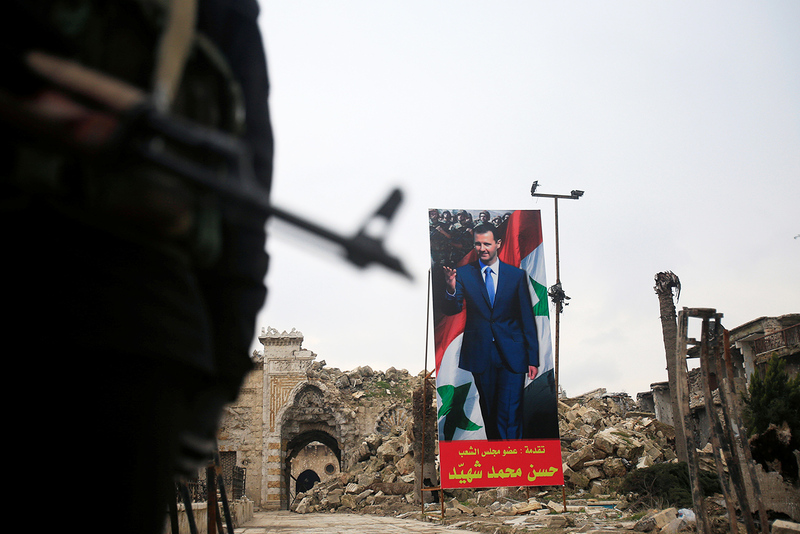 "The Kremlin's position is the following: Assad's fate must be decided by the Syrian people, not by Donald Trump," said Viktor Nadein-Raevsky, a senior scientific collaborator at the RAS Institute of World Economy and International Relations. In his opinion, Russia will not change its viewpoint on the Syrian conflict and will continue striving to get the regime and the opposition to find common ground during talks in Geneva and Astana, although after the latest escalation it will be very difficult. Russia's influence on Damascus, despite the importance of the Russian Aerospace Forces' military support, is not at all unlimited, remarks Grigory Kosach, professor at the Modern East Department at the Russian State University for the Humanities. "Assad has never been a pawn in Russia's hands and his actions, deeds, and statements have often contradicted Russia's official point of view." For example, Assad said on many occasions that political regulation and reforms must be preceded by "a full victory over the terrorists," while Russia is in favor of the immediate launch of the political process. Kosach also notes that for Moscow it’s not easy to influence Damascus since Assad is its main partner in Syria. "Renouncing support for Assad can lead to Russia losing everything it has gained in Syria since it does not have relations with the opposition and the possibility for developing contacts is very limited." Russia basically does not have much room to manoeuvre regarding its relations with Assad, Kosach stresses. At the same time experts believe that Russia's partnership with Damascus has its limits: It’s doubtful that Moscow will engage in direct military conflict with the U.S. to protect the Syrian regime. Commenting on the fact that Russia did not try to shoot down the Tomahawk missiles that Washington fired at the Syrian government airbase in the Homs Province on April 7, a Kommersant source close to the Defense Ministry said that, "Russian air defense systems in Syria primarily protect Russian military infrastructure and we didn't have the objective of covering the entire Syrian sky." Russia does not have obligations to protect the Assad regime, affirmed political analyst Alexei Arbatov in an interview with Kommersant FM. "Our anti-aircraft missiles protect our air and sea bases. Syria is not our ally, but only a partner." Grigory Kosach also believes that Russia will not go to war with America in order to protect the Syrian president. "If the confrontation develops to the limit, in which a direct clash is possible, obviously Russia will have to find a different way of solving the Syrian problem." On the other hand, in Kosach's view, the situation is still far from the "renouncing Assad, or war" choice, which is why in the near future Russia will definitely not change its policy. Read more: How will Russia respond to the U.S. missile strike on Syria's airbase?